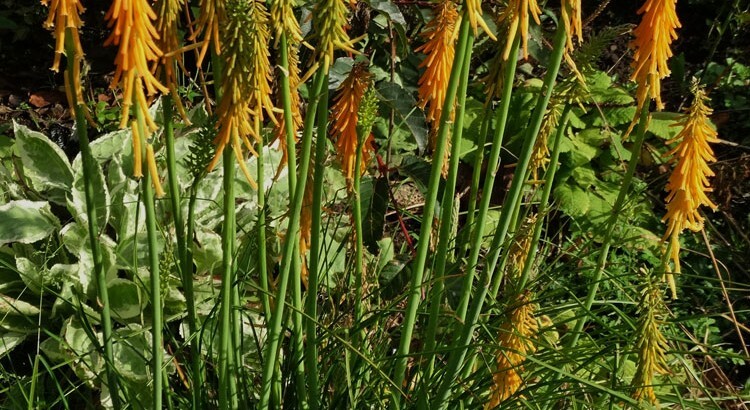 For many years, whilst running Edrom Nurseries, I grew a neat little plant called Kniphofia galpinii which I had obtained from Jack Drake’s legendary nursery in Aviemore. Clearly a hardy member of Asphodelaceae, native to the mountains of South Africa. Having moved on from my base in Berwickshire I re-obtained the species from a new source and have since enjoyed growing a slight variation of the foregoing species, taller growing and a little more robust. I have determined that my later acquisition was Kniphofia triangularis which can attain to 60 cm in an open, sun-drenched site. This is a most valuable plant as it produces its first spikes of flower as late as October running on to late November. I have it positioned to the front of a mature Daphne retusa – I suspect that this position was unplanned, however it works admirably having a strong evergreen background for the grassy foliage and slender spikes of vibrant orange in the autumn. This species was first introduced to the UK by celebrated plantsman and ornithologist Collingwood Ingram, 1880-1981 in 1927 (famed for the marvellous Omphalodes ‘Cherry Ingram’). Kniphofias have rightly become more popular in recent years with some delightful new Cultivar Groups entering the trade and with some relief, accompanying a new publication, “Kniphofia: The Complete Guide, published by the RHS. This volume, written by Christopher Whitehouse will go a long way to sort out the taxonomy of this popular genus and increase the popularity of these “Red Hot Pokers”. I have found that the species establishes itself quickly, assuming a decent sized clump (up to 45cm spread) which can be lifted and carefully divided during the growing season. I favour a less radical approach to division just before flowering but would always give the clump a complete soaking a day before action starts. I would suggest taking a smaller garden fork and going around the perimeter of the plant carefully easing away the sturdy growth. You will easily assume a dozen or so divisions without disturbing the whole mother plant. Having eased away plenty of material with slightly damaged roots, these should now have the top 50% of vegetative foliage cut back to reduce transpiration (water-loss). The plantlets can now be potted up in deep 9cm pots to become established propagules. During the first few winters until established, I would give the over-wintering crowns a generous mulch of leaf mould. I can strongly recommend this species for a sunny well-drained position and how wonderful it looks when associated with a few autumn-flowering Gentians, such as GG. ‘The Caley’, ‘Alex Duguid’ as well as late-flowering Sedum ‘Vera Jameson’ or S. cauticolum. 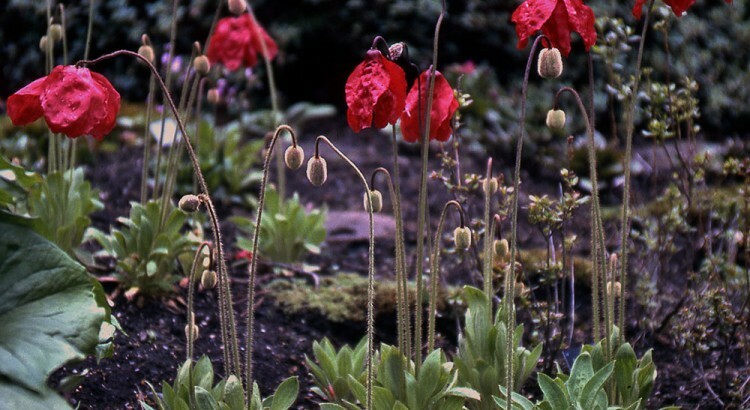 This species is now well established in cultivation and can be purchased as young plants or raised from fresh seed (for members of the Meconopsis Group). It was first discovered in north-eastern Tibet (now Qinghai province) in 1884 by the Russian Przewalski and soon thereafter herbarium material collected by Potanin. It was eventually introduced into cultivation by E. H. Wilson in 1903 from a seed collection in N.W. Sichuan and later more successfully by Joseph Rock in Gansu. It never really took a proper hold in cultivation until it was re-introduced in 1986 by Cox and Hutchinson. I can well recall a visit to the RHS Horticultural Halls from Roy Lancaster who unfolded a pocket handkerchief and passed on a pinch of good seed he had collected in SW China. That was me (Edrom Nurseries) starting out with this lovely plant in the mid 1980s. In nature Meconopsis punicea grows in mixed scrub on open hillsides and in woodland margins at an altitude of 2800 – 4600m. It grows in close proximity to other species of Meconopsis including, MM. integrifolia, sinomaculata, psilonomma and quintuplinervia with which it hybridises to produce M. x cookei. In cultivation, it would be churlish to suggest that this species can be grown easily, however in ideal conditions, well suited to Meconopsis in general, it is not challenging at all. In Grey-Wilson’s most recent Monograph of the genus, he states that the species is a “tufted perennial, sometimes monocarpic”. In my experience I would describe it as a monocarpic species (taking a year to flower and from a single rootstock will die), sometimes perennial. A few observers have suggested that the plants can be perennial and, on closer observation the plants have been “bunch pricked out” meaning that the plants are made up of a number of plantlets, fooling one to think that it is perennial. In fact the strongest plantlet will flower and die allowing subsequent plantlets to strengthen up and flower. Some of the finest plants I have seen offered are stocks raised by the very experienced Dr James Cobb and I would say that when you get started with good quality plants such as these and get them in position in early spring they will flower well and produce good seed. I do not recommend planting out in late summer or autumn as the young plants may be encouraged to flower early and very poorly. In the garden I would choose a partly shaded area providing a good deep soil with added humus made up of very well-rotted horse manure or leaf-mould. This may sound as if I am still in business but I would recommend at least 7 plants and they should be given some 9 to 12 inches apart. In a good year, such as this, the species will commence flowering in E. Scotland towards the end of May. A succession of flowers on strong plants will persist until the end of June. During this time the individual flowers will go over and the maturing capsules will turn upwards from their nodding position. At this stage the capsules need to be watched as they will begin to dehisce (open up). They need to be removed and placed in a clean and dry, empty yoghurt pot. When the capsules are all dried out and open, the seed can be removed and placed on a clean white card. The seed must be graded and only the grains that are the size of Demerara sugar can be retained and sown right away in an acid seed compost. I always cover the seed with a thin layer of coarse sand, label well and water from the base. The seed may well germinate in the autumn and I would leave them well alone and not prick out until the spring. As I have already said I would not prick out singly but endeavour to prick them out in twos or threes. There can be no doubt that, as the late Sir George Taylor commented in his Monograph of 1934, “No species has drawn such superlative and almost extravagant epithets as M. punicea”, he was correct. Planted amongst a few choice leafy plants such as Podophyllum or Epimediums and some of the perennial blue-flowering Meconopsis, M. punicea can be shown off to its very best. I can fully recommend the lovely cultivar M.’Sichuan Silk’ raised by Ian Christie from wild-collected seed. This is a fertile clone that may well have some M. quintuplinervia blood in it as it produces slender offsets making it a fine garden plant. If raised from seed it should correctly be named M. Sichuan Silk Group. The flowers are a subtle shade of strawberry red. The hybrid Meconopsis x cookei ‘Old Rose’ is a strong growing perennial with pinkish-mauve coloured flowers and easily grown in dappled shade. For many years I made a poor showing of my cultivation skills with the “Christmas Rose”, Helleborus niger. This was always a disappointment as my parents seemed to succeed by growing their plants hard up against the south-facing brick wall of their house, extra warmth generated from the wall I felt. Many years later I was to botanise with friends in the Austrian foothills near to Kufstein in the first week of April. The goal was to photograph this hellebore in full flower in its native habitat (see photos). The species is widely distributed across Eastern Europe and in Slovenia one can find some unusual colour variants. My friends took the precaution (prior to my making a special journey from Scotland) to check out the location to make sure that the plants were worthy of inspection. The expedition involved driving up to a restaurant car park where there was still a light covering of snow. We then fitted our snow shoes and made a gentle climb in deep snow through mixed woodland of beech and spruce. After some 30 minutes ascent we came on some steep clearings (where the snow had thawed) that provided a carpet of Helleborus niger growing in modest clumps having just opened their blossoms to present a stunning display of near perfect snow-white coloured flowers. I was simply thrilled at the quality of plants and flower having never experienced such a sighting. Amongst the Hellebores were emerging Hepaticas in blue and white-flowered forms. On closer inspection I noted that the previous year’s foliage was still present, but on the point of decay, lying flat from the winter snow canopy. In a few locations, most notably beside a track-way I was able to carefully study the structure of the plant and its root-system. Looking at a cross-section of the soil profile to a depth of some 60cm, I noticed that the top 15cm was made up of semi-rotted leaf-mould or humus. Heading down, the soil predominated and consisted of gritty to stony loam made up of a deeply calcareous substrate ending up with pure gravels and stones at a depth of 60cm. Here lay the answer to my years of disappointment! First and foremost my soil pH was too acid and possibly ill-drained. Dappled shade would work and perhaps some supplementary protection of the developing buds, however these factors may not be essential. The alkalinity had an important bearing, but depth of free-drained soil with extra humus is a vital ingredient. My parents choice of situation by a wall had less to do with the protection and more to do with the lime filtering out of the mortar, I feel. Some liquid feeding (with tomato feed) of clumps during the growing season will certainly fortify mature plants to encourage flowering and I choose to de-leaf in the late autumn and then top-dress with finely chopped pine bark. The discipline of de-leafing all evergreen hellebores will help to prevent black spot and deter the attention of voles which love to devour the developing flowers amidst the protective canopy of foliage! My Granny who gardened in Eastbourne on chalky soil grew excellent hellebores, including the Christmas Rose and created a little tent to protect its flowers and ensure a fine harvest for Christmas Day! So there we have it. Over the years I have encountered many fine cultivars of Helleborus niger, which would almost inevitably be further propagated from freshly harvested seed. The seed strains (as we used to call them) would produce similar offspring to the parent plant, but not identical. It would therefore be more accurate to give these strains the current name of Group, so we can offer a fine range of H. niger Potter’s Wheel Group. Some of the superior clones display a showy more rounded flower with a green eye. When it comes to propagation I would not recommend lifting established clumps and dividing them as they generally resent root disturbance. This species can be raised from freshly sown seed which van be saved and removed from the seed capsules and sown on a John Innes seed compost and given a generous covering of grit. Protect seed trays from mice and birds and I prick out seedlings once they have produced the second leaves and as with other members of the buttercup family, they prefer a deep clematis pot at potting up stage. A number of variants can be found from specialist nurseries and botanical sources including Helleborus niger subsp. macranthus which is distributed in Eastern Europe and Italy. I am very familiar with this variant as it abounds in the cooler aspects of the marvellous rock garden in the Munich Botanic Garden. The foliage of this species is fairly distinct with its bluish-green to grey-green hue. There are now a whole range of modern hybrids, many of which are proving quite hardy and clearly possess the benefits of “hybrid-vigour”. These include: H. x ericsmithii ‘Winter Moonbeam’ with attractive foliage and white flowers that gradually fade to pink and the much sought-after H. x belcheri ’Pink Ice’. As the current summer continues to impress both north and south of the border, I am taking careful note of certain trends in the garden. One such trend is the way that Rhodohypoxis species and cultivars have prevailed due to a series of mild winters and favourable summers, allowing ripening of the bulbs/corms. I well recall during my formative years as a gardener and later nurseryman, that a stern winter with modest snow cover would decimate bulbous species, both in containers and in the ground. I lost my entire commercial stock of Rhodohypoxis in 1982/3 and was very fortunate to know the late Valerie Finnis and obtained stocks of all the recognised cultivars raised by Mrs Ruth McConnel. No such fears of devastating frosts in recent years. As is so well documented by Richard Wilford in his excellent volume “Alpines, from Mountain to Garden”, 2010, Rhodohypoxis are among the most popular cultivated geophytes (bulbous plants) from South Africa. He continues, “This is a genus of low-growing, starry-flowered perennials in the family Hypoxidaceae, which is centred on the Drakensberg Mountains. They can bloom for several months in the summer and die down completely for the winter”. Six species have been recognised, along with a whole host of cultivars, many of which have appeared on the scene in recent years and still await a home in my garden. It is important to observe something about their habitat and the prevailing weather conditions. In nature they grow in damp grassland and rocky places at altitudes of between 1,100 – 2,900m and receive a protective covering of snow in the winter (meaning a relatively dry dormancy. Let’s translate that into our lowland gardens. They should be grown in a well-drained, humus–rich mixture, either in the open ground (with the provision of winter protection) or in troughs and similar containers which can be transferred into a shed/glasshouse during the winter months. As soon as the over-wintering corms break into growth, they should be given a regular watering and as the season progresses, both during and after the first flush of flowers I will apply a well-diluted tomato feed which will strengthen the corms and encourage a further blast of colour. I am a bit of a die-hard and continue to stick by the original and well-tried cultivars raised by Ruth McConnel, some of which were named after her dogs! However, I was browsing the current catalogue from Edrom Nurseries (another excellent collection of well-grown plants) and chanced on a whole host of new and unfamiliar cultivars – some will soon need to be purchased! Nowadays I grow nearly all my Rhodohypoxis in troughs and rarely collect the seed, resulting in a few un-named seedlings appearing amongst their parents. I allow this to continue since I am no longer in business. Of the tried and tested cultivars the following will be guaranteed to perform well: Red-flowered, ‘Albrighton’ and ‘Great Scot’; Pink-flowered, ‘Dawn’ and ‘Fred Broome’; Pure-white, ‘Perle’ and ‘Ruth’; White-flushed pink, ‘Helen’ and ‘Pictus’. Of the species I would recommend the stong-growing red, R. milloides and a good pink, R. baurii var. confecta. Ten of the best and then have a go with some of the newer cultivars. I’m afraid I am not keen on the double-flowered cultivars but I am sure I am the exception! Finally I find the process of propagation very rewarding and carry this out whilst the plants are in growth, carefully teasing the corms apart into generous clumps of several cormlets and potting them up or planting out to allow time for establishment before the onset of winter. Seed can be saved and sown at the usual time for those of you who wish to continue the search for a “winner”! I’m often asked, “Which are the ten snowdrop cultivars one cannot do without!” My choices have remained pretty static over a number of years, however, I do occasionally have to make some alterations/additions. More recently I have added the magnificent form of Galanthus plicatus, ‘Gerard Parker’. I have not yet managed to track down the exact origin of the name but have read that Gerard Parker was an artist and good friend of E.A. Bowles in his later years. What, for me makes this such an outstanding cultivar is that it stands out as being immense in stature, with attractive plicate foliage and the fulsome flowers hanging in a quite stately manner like ornamental lanterns. On closer inspection one can appreciate the veining on the outer segments. This is certainly “one” for the top ten. This is one of my favourite double snowdrops and ranks with the very best proving to be early-flowering each year. Some growers feel that it is indistinct from the popular Greatorex double G.’Dionysus’. I am not sufficiently experienced with the latter clone to comment, but my choice refers to a tried and tested plant of the highest quality. It is tall and graceful with the scape rising clear of the foliage. The beautifully formed, double flowers contain neatly packed inner petals demanding closer inspection. I have grown this snowdrop since it was given to me by Dr Evelyn Stevens (who named it after her late mother) in 1996. When I exhibited it at one of the early RHS Spring Shows it immediately caught the attention of the Galanthophiles and experts and will continue to do so. Galanthus ‘Sybil Roberta’ is a very good doer and should be lifted and divided regularly to maintain health and vigour. I have been growing this snowdrop for a number of years now and it too stands out in a crowd. It is striking for its compact nature and its vigour. It arose at The Linns and will prove to be one of Dr Steven’s best raisings. I would guess that this is a natural Galanthus nivalis hybrid, possibly crossing with some of Evelyn’s fine forms of G.plicatus. Certainly one to look out for. I have to say that, over the years, I have been fairly unsuccessful with the cultivation of Sternbergia species in the open garden. I had always felt that the bulbs, despite being planted in an open, well-drained position did not receive sufficient heat and summer ripening, so often a handicap of gardening in Scotland. It was most refreshing to encounter a fine stand of the pictured Sternbergia sicula, growing in an open sunny position with acute drainage in the Rock Garden at the Munich Botanic Garden. The picture was taken in late September and, having served my apprenticeship at this wonderful establishment, I can reassure readers that the winters in Munich ensure that this plant will be fully hardy! The species is native to S. Italy, Sicily, the Pelopponese (S. Greece), the Aegean Islands and is common in Crete. It inhabits dry, stony terrain, including grassy places and open scrub. Flowering during the late autumn in nature, it consists of a large bulb (up to 16 mm in diameter) and can be distinguished by its large golden-yellow flowers and bright green foliage appearing with or before the flowers. When planting Sternbergia bulbs add plenty of washed sand in the hole and position in an open, sunny situation. Propagation can be carried out easily by dividing up established clumps of bulbs. Here is a gentian species that, in its true form, deserves a place in every alpine garden. A native of the W. Caucasus Mountains and first described by Albov in 1895. It is scarce in its native habitat and was relatively recently introduced into cultivation by Eric Pasche of Wuppertal, Germany, Hans-Erik Jensen of Denmark and Jim and Jenny Archibald. I remember raising material from Jim Archibald and offering it from Edrom Nurseries. The species has now become well established in gardens but has inevitably hybridised with its close relative, G.septemfida. The resulting hybrids are widely offered in the trade as plants and seed strains and are equally beautiful. Gentiana paradoxa was given its name as it was the only species, known at the time of its introduction with leaves in a whorl of five. The plant belongs to the botanical subgenus pneumonanthe and is determined by its single un-branched stems (most hybrids are multi-stemmed) densely clothed with whorls of narrow linear leaves and solitary flowers held erect. The flowers are a clear electric blue with fine blue plicae (folds between the petals) giving a delicate fringed effect to the mouth of the corolla. Significantly, the flowering season extends through the whole of September to mid-October. It is easily raised from seed but expect hybrids when grown in close proximity to closely-related species. I am delighted to recommend this late summer–flowering roscoea which has become more widely available in the trade in recent years. The plant was introduced into cultivation in September 1993 from material collected by Baker, Burkitt, Miller and Shrestha in the Buri Gandaki valley, Nepal. It was initially named R. purpurea forma rubra and then given the cultivar name ‘Red Gurkha’. Over the past few years this cultivar has been crossed with another form of R. purpurea ‘Brown Peacock’ by Robin White and some fine seedlings have arisen. One has been selected and given the name R. ‘Royal Purple’. The recommended cultivar is easy to grow in an open, sunny position with the provision of a deep, well drained soil. I have recently noted the real benefit of adding a generous portion of washed river sand with a few handfuls of well-rotted horse manure when planting roscoea. The only time I am nervous of losing these subjects, including arisaema species, is when they have failed to establish prior to the winter. I also mulch these plants, when dormant, with a 5cm layer of well-rotted bark as a form of winter protection. The form of ‘Red Gurkha’ that I grow (with red pseudo-stems) has never set seed and I must admit I have made no attempt to hand-pollinate. I gather that there are forms which have green pseudo-stems and that these are more likely to set seed. Readers can make their own choice! Propagation is quite simple from division of established clumps and there are a number of times to carry out this practice. My preference is to lift clumps in late autumn as they commence dormancy but great care must be taken not to damage the congested, fleshy roots. The easiest way to identify the individual plants and the resting buds is to completely wash the roots and then prize them apart. Each division can then be potted up in a deep pot consisting of a very well drained mixture containing plenty of sand and perlite. Having watered the plants it is important to keep them frost-free and never to allow them to become water-logged. I prefer to plant out in the spring after fear of frosts. Plant deeply with plenty of washed sand as mentioned previously, at least 20cm apart. As the great alpine plant author, Reginald Farrer wrote, “this is the jewel of jewels among our European saxatile species”. Yet, I feel that there is little value in extolling the virtue of a stunning plant purely for its natural beauty when it gives the keen gardener little or no chance of cultivation. We are under no illusions as to its virtue as a pan-grown plant under glass or its successful culture in a protected “tufa” cliff. So what about its culture, aside from the two afore-mentioned suggestions? In an open garden situation, provided plants are given winter protection from overhead precipitation, plants can be brought to successful flowering. Let’s consider for a moment from where this species is native and just why Primula allionii is so special. The plant is only native to a restricted location in the Maritime Alps between Cuneo and Nice, predominantly in France. It grows as a saxatile (i.e. living amongst rocks) plant preferring a vertical position in a type of limestone that is easily identified from its colouration and is often referred to as Breccia conglomerate, somewhat akin to our own “tufa” rock. Perhaps significantly, despite its precarious position careful inspection reveals that the cliffs are pitted and allow falling rain to drain through the plant’s roots as opposed to running off and causing the plants to dehydrate. The primula is more generally found growing in south-facing exposures, but can just as easily be located in shaded caves. I have photographed it in full flower between the 12th and 15th March at an altitude of 700m. It is hard not to become overly ecstatic on finding the plant in its native habitat at its floral best. The temptation to collect wild plant material should be strongly discouraged as there is such an abundance of cultivars of this stunning primula available in the alpine trade and all those privileged to travel to these parts should be allowed to enjoy the full range of plants in all its glory. I hope that having created a picture of how this primula performs in nature we can now translate some of its essential requirements to the garden setting! The most successful method of growing it is in blocks of “tufa” rock. Tufa is a relatively lightweight, extremely porous, calcareous rock and holes can be bored into its surface with relative ease. The name tufa comes from the latin tofus, meaning a soft stone. I would recommend that, having purchased some pieces of tufa (at least 60cm sq) they should be positioned in an open, but sheltered location and buried up to a quarter of its depth so as to allow some moisture uptake by capillary action. I would carry out the planting in early spring to give the plants a full season to get established. First of all drill the holes at 45% to the vertical in order to retain the plant and compost. The holes should be about 25-30mm in diameter and up to 9cm deep. Young plants should be chosen with a small rootball no larger than a walnut. Have an empty tray available to retain materials for planting. Loosen the soil carefully from the plant and retain the substrate and mix this with the tufa residue that has been created from the hole and mix with a little extra sand. Prior to planting it is important to thoroughly soak the piece of tufa and allow it to drain. The small plants should also have been well watered prior to planting. Having loosened the soil from the plant we are ready to insert the root system. It may be helpful to lay the roots on the back of a pointed, concave tool to ease the roots into the hole. Before back-filling make sure that the neck of the plant is in the correct position. Carefully add the compost, a teaspoon at a time and firm gently with an appropriate tool. It is important to carry out this operation carefully to ensure there are no air pockets or damage to the roots. Water carefully and maintain a regime of watering until the young plants are established. I would strongly recommend positioning this block of tufa so that it can be effectively covered or protected with a pane of glass/polycarbonate during the dormant season. I would experiment with Primula allionii in a variety of positions to see which works best of all. In the shadier positions, try a few plants of Kabschia saxifrage or a Jankaea – sadly we are now supposed to spell the generic name Jancaea due to an original mistake made by botanist Boissier in 1875! There can be no doubt that this form of gardening with the specialist use of materials like tufa will allow the successful cultivation of some of the worl’s most challenging and enchanting alpine plants. Garden visits are beginning to become a reality as we plan our weekend trips and as January develops into the spring months, Snowdrops will be the most frequently observed flower in British gardens. Oh yes, there will be gasps as we lean into a well-flowered shrub of Daphne bholua ‘Jaqueline Postill’ or the pungent inflorescense associated with Hamamelis x intermedia ‘Pallida’, but a mass planting of snowdrops or better still naturalised in grass is the pinnacle of our garden visit. I have my favourite gardens and vantage points for snowdrops, as indeed will many of my readers. My wife Alison though, has served me a final warning for averting my eyes from the road whilst driving past a wooded glade, amassed with the common snowdrop! Plant association brings these delightful spring bulbs to life in the artificial garden setting and, as well as the afore-mentioned shrubs, the introduction of attractive trees featuring their bark, such as Betula species, including B. nigra ‘Wakehurst form’ with brown peeling bark and attractive catkins in early spring. I love the vibrant colours attained from carefully pruned or “stooled” specimens of Cornus sanguinea cultivars such as the orange hued C. s. ‘Midwinter Fire’ surrounded by a generous planting of snowdrops, winter aconites, Eranthis hyemalis and the shaggy Crocus tommasinianus. I would like to feature the rather elusive “yellow snowdrop”, now correctly named Galanthus nivalis Sandersii Group. I make a pilgrimage with trusted friends each year in mid February to study the diverse population of this curious snowdrop in its “locus classicus” in Northumberland. In its chosen habitat of damp, deciduous woodland a fine sight can be enjoyed, with thousands of typically marked snowdrops interspersed with about 1% of aberrant yellow- flowering forms. 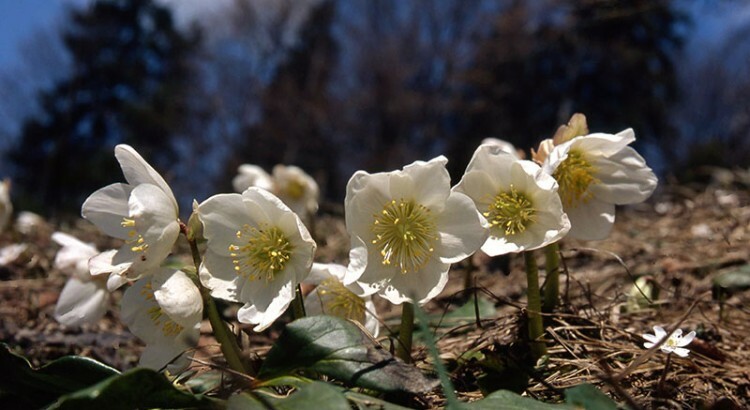 Perhaps this is a gene that is carried very rarely in this genus similar to the occurrence of double-flowered forms in anemone and hepaticas. There are a number of yellow-flowered forms of snowdrop available in the trade, with a few commanding a high price. Look out for the vigorous G. Nivalis Sandersii Group, G. plicatus ‘Wendy’s Gold or the two hybrids, GG. ‘Spindlestone Surprise’ and ‘Primrose Warburg’. Established clumps of snowdrops should be lifted and divided when the bulbs are dormant or carefully transplanted into fresh soil “in the green”. Great care must be taken with the latter choice, not to allow propagules to dry out after transplanting. Give newly established plants a generous mulch of well-rotted leafmould. Equally easy of cultivation and worthy of a place in every garden, is the dwarf, bulbous iris, I.’Katharine Hodgkin’. With masses of showy ice-blue coloured flowers this vigorous hybrid combines all the qualities of its now rare parent species, the lemon-yellow Iris winogradowii and blue-flowered I.histrioides. It was the great plantman, Bertram Anderson who raised the hybrid in the 1960s and subsequently named the resulting plant after the wife of his friend Eliot Hodgkin. E.B. Anderson as he was often known, gave some bulbils of this hybrid to my predecessor, (proprietor of Edrom Nurseries) Mr Alex Duguid and he quickly amassed a sizeable stock of bulbs in a large trough. He sold bulbs to Broadleigh Gardens in the late 1970s and I inherited the rest of the stock which, together with bulbs from my competitors, was soon travelling in all directions of the UK. It is now widely grown and generously planted in borders beside snowdrops, Cordalis solida cvs, dwarf narcissus and hepaticas. I choose to lift congested clumps of bulbs during the dormant season (September/October) and divide them up into modest clumps and replant into re-generated soil with the addition of gritty sand and well-rotted leafmould. Take care not to shed the numerous rice grain bulbils as they may re-appear where you least expect them in a few years time! As I write this piece in early October, a whole range of autumn-flowering gentians of the Frigida section are showing their abundance of flowers. In general this group of alpine plants is flowering much later (some 2 weeks) than is the norm, but with the ample, autumn sunshine their flowers are a real joy and should be more widely planted. I have already highlighted this species as “one to look out for” (autumn 2011) but would like to write a little more in general about this species, as well as some of its allies. I was thoroughly motivated by the typically eloquent article written in The Rock Garden (July 2012) by Zdenek Zvolanek and superbly illustrated by Milan Halada, both excellent growers from the Czech Republic. The article reminded me of the writings of the great plant hunter and explorer, Frank Kingdon-Ward, 1885-1958. He wrote, “Few rock-plants give the alpine gardener more unalloyed delight than gentians. Not all gentians are the ultra-blue trumpet flowers we admire so much and it is a waste of time trying to persuade ourselves that geese are swans. The mere fact that a plant is the scion of a noble family carries no assurance that it is in itself noble”. So true! For us, we also need to sift through the dross and select the very best! So, I wish to write for a moment about gentians of the Ornata Group belonging to the section Frigida, from a taxonomic point of view. When referring to the above article by my Czech friends, one can only imagine that these wonderful flowers must be seen to be believed. They are to be seen in nature at their flowering-best from mid-September to October at an altitude of 2500 to 3000m and up to 4800m. Many of the finest species are Sino-Himalayan and hale from the rich provinces of S.W. China, including Yunnan, Sichuan and Gansu. For many years the most widely planted species was the splendid Gentiana sino-ornata. First discovered by George Forrest in 1904, it was found growing in moist alpine meadows near the summit of the Michang Pass in N.W. Yunnan. Variable in flower colour in nature and tending to be rather straggly in habit, the popular form grown today is a good doer and forms strong clumps with deep royal-blue flowers. G. x stevenagensis ‘Bernardii’, G x s. ‘Frank Barker’ and the splendid range of cultivars raised by Dr. Keith Lever, including G. ‘Shot Silk’. Look out for his full range of cultivars with the epithet ‘Silken’. All of these species and cultivars can be grown in an open position in an acid moisture-retentive mixture and are easily propagated by division by lifting established clumps in April and teasing the thong-like roots apart. Re-plant (at about 12 to 18 inches apart) in rejuvinated soil and water well until the young plants have established.